You like me... You really like me. I am so happy... I just found out that I've been nominated for a WEGO Health Activist Award. I've been nominated in the Best in Show: Facebook Award. It is an honor to be recognized. I feel like Sally Field when she won the Oscar. I am proud and humbled by this recognition and also happen to be dancing around my living room. Thank you so much! Now playing "Just Dance!" by Lady Gaga. Where would you go if you could go anywhere? "If I could go anywhere." The prompt for Day 27 is vague... it doesn't say anywhere in the world, then my answer would be somewhere in Europe like Paris, France or London, England; or exotic and far away like the Wolong National Nature Preserve in China, where I could get up close and personal with and learn about Panda Bears. If I could go anywhere, I would go to a place without pain. Does that place exist? I would like to live there, in the "pain free" zone but instead I am going to think about places that do exist. Places that would and could help me better manage and control my health issues and condition, thus improving my Quality of Life. An escape and life-changing journey is 90 minutes away from my home... if I could go anywhere. I would fill my car with gas and drive South to check-in at La Costa Resort and participate in the Chopra Center's transforming program inspired by Deepak Chopra’s best-selling book Perfect Health. The weeklong program is a total mind-body healing experience. "Perfect Health is offered exclusively at the Chopra Center, nestled on 400 coastal acres of La Costa Resort & Spa. This oasis of bliss and rejuvenation is an ideal setting, with guest rooms located just steps away from the Chopra Center. When you’re not enjoying healing therapies, meditations, or instructional sessions, you can luxuriate in the gorgeous spa area, sip tea in the breathtaking tropic gardens, and feel the caress of the fresh ocean breeze in the Mediterranean-style verandas. The Chopra Center has arranged preferred rates for our guests staying at La Costa. In this beautiful, soothing environment, you will feel your stress and tension melt away as our highly trained team of physicians, certified educators, and healing arts masters help you restore your balance and address your personal health and life concerns. The lifetime benefits that one week at the Chopra Center could not be measured, the lasting impact would have a ripple-effect on my life. I have had the priviledge of experiencing a few Ayruveda treatments over a weekend and know that the weeklong program will be memorable. There are so many "New Year, New You" products, workshops and websites, how could we possibly fail in the New Year?! We had a laugh when we read that the average life span of a "New Year's Resolution" lasts only 10 - 14 days. And over 80% are abandoned by the end of January! We all have fallen prey to "in the new year I'm going to..." making heartfelt commitments in earnest only to find ourselves feeling defeated and resigned to continuing with our old ways. We wanted to host a workshop where we would help you create what you want your life to be in this year, and every year, in a conscious and compassionate way. We will share techniques for creating awareness and making choices from a position of balance and integration. We will work with a psychospiritual body of work to explore shadow aspects within us (not bad, just unknown!) as well as internal voices which range from our inner guidance and intuition to judgmental or critical voices which breed fear and hold us back. We will start the day with Shakti's powerful technique of Creative Visualization and weave different meditations and practices throughout the day. Weather permitting, we will get outside and access nature too. (A photo of the view from Tiburon, looking towards San Francisco. Amazing, isn't it?) I have been to a few workshops led by Shakti Gawain and they were only a few hours long. The locations were quaint bookstores not the warmth and coziness of her home. "Everything is Unfolding Perfectly." has become one of the mantras of my life. I feel that after a day at this workshop my 2013 would be off to a creatively empowered start with inspiration from Shakti and Gina. There are other places I could go, but I wanted to share these two with you for WEGO Health's National Health Blog Post Month. Word Cloud or Meme, sometimes the frustatration of living with chronic pain is devastating and as much as I strive to thrive the agony bothers me to the verge of defeat. The edge is not a fun place with a beautiful view. The edge is bleak, depressing and sad. After 25 days of writing for WEGO Health's National Health Blog Post Month, today's post is a briefly exploration of me, graphically speaking. Sometimes, I smile through the pain, not wanting to show my true feelings and other times I just want to yell... "Fog Off Lupus!" written for Day 26 of National Health Blog Post Month "Make a chart/meme/poster and write about it." Evolving Goals... finding the flair. Sometimes it is hard to find the "flair". The truth is lupus hurts, I try to celebrate that "Lupus awareness is fun." but when friends are suffering and the daughter of a NBA hero dies at the young age of 22 it is hard to accentuate the positive. I move forward and share my story. I share my story and the stories of those who no longer can. I share my story of what walking with a gold medalist is like. I tell the story of what is was like to dine at "Joanne's" in New York City on World Lupus Day. I shine and go on, because if I don't, who will? I was silent for too many years, the time to shine a light on lupus awareness is now. Scientists are on the verge on breakthroughs and crucial research support could lead to innovations that improve treatment and potentially cure lupus. My goals as a patient have evolved from trying to "live with lupus" to striving and "thriving with lupus." My goals as an advocate are constantly evolving. I hope that in the next year, I am able to share my story to encourage more members of Congress to join and support the Congressional Lupus Caucus. This year alone, my voice is responsible for getting Congressman Brad Sherman and Congresswoman Karen Bass in the caucus. My goal now is to "ignite" the health care, social media and lupus communities to collaborate and partner in creating wellness through my participation with the Society for Participatory Medicine, Regina Holliday's "The Walking Gallery" and by speaking and sharing my story wherever and whenever I can whether at health conference, writing my blog or creating a YouTube video or on my favorite television show. My goals and visions for the rest of 2012, looking forward to 2013 are too vast to include here but I will share my vision board as soon as it is ready... I am always on a quest to find the "flair' while avoiding a flare. That's my "Lupus Style." written for Day 25 of WEGO Health's National Health Blog Post Month! Fluffy purple fleece with white and purple lettering that reads "Lupus Awareness is Fun!" the design is simple and clear. I would carry my flag proudly at the Alliance for Lupus Research "Walk with Us to Cure Lupus" events that I attend from coast to coast. I produce the flag as a blanket as well, on that could offer support to members of the lupus community. 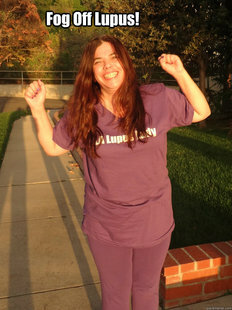 The purple fleece is warm and embracing and whether flying as a flag or covering a "lupie" at home, there is strength in sharing that "Lupus Awareness is Fun!"